Edward Earl Reed Jr. (born September 11, 1978) is a former American football safety who is currently the assistant defensive backs coach for the Buffalo Bills of the National Football League (NFL). He played college football for the University of Miami, where he was a two-time consensus All-American. He was drafted by the Baltimore Ravens in the first round of the 2002 NFL Draft and played eleven seasons for the Ravens before signing with the Houston Texans, and later the New York Jets in 2013. He finished his career with the Baltimore Ravens, signing a one-day contract on May 7, 2015. During his playing career, Reed was selected to nine total Pro Bowls, was the 2004 NFL Defensive Player of the Year Award winner, and has an NFL record for the two longest interception returns (106 yards in 2004 and 108 yards in 2008). He also holds the all-time NFL record for interception return yards, currently with 1,590, and postseason interceptions (9, tied with three other players). His 64 regular season interceptions ranked him 6th on the NFL's all-time leader list at the time of his retirement. Reed is considered to be one of the greatest safeties in NFL history, if not the greatest, and was often referred to as a "ball hawk" during his prime. Reed was best known for studying film to memorize opposing teams' tendencies, as well as his ability to lure quarterbacks into throwing interceptions. Reed was born in St. Rose, St. Charles Parish, Louisiana on September 11, 1978. He attended the Destrehan High School in Destrehan, Louisiana. He was an all-state selection at defensive back and as a kick returner and also the New Orleans Times-Picayune District Most Valuable Defensive Player. He totaled 83 tackles, seven interceptions, three forced fumbles and 12 passes deflected in his senior year while also seeing action at running back and quarterback. He also returned three punts for touchdowns. Reed's jersey number 20 was retired by the football team. Reed also played basketball, baseball, and track & field. Reed was also a standout track athlete at Destrehan High School. He was a member of the state champion 4 × 100 metres relay squad. He set a high school record throw of 56.94 meters in the javelin throw. Also a standout long jumper, he recorded a personal-best leap of 7.20 meters. Reed also joined the Miami Hurricanes track and field team in 2000, where he competed as a jumper and javelin thrower. He placed 7th in the triple jump at the 2000 Big East Championships, setting a career-best jump of 14.58 meters. In addition, he finished 3rd in the javelin throw, with a personal-best throw of 60.08 meters. Reed received an athletic scholarship to attend the University of Miami, where he was a standout defensive back for coach Butch Davis and coach Larry Coker's Miami Hurricanes football teams from 1997 to 2001. He played for the Hurricanes team that won the 2001 National Championship. After redshirting in 1997, Reed led the team with 2 interceptions and 4 forced fumbles in 1998. He had 2 more interceptions in 1999. Reed was recognized as a consensus first-team All-American in 2000, and a unanimous first-team All-American in 2001. In 2001, he led the nation with nine interceptions for 209 yards (a school record) and three touchdowns. He helped seal a memorable win over Boston College in 2001 when he grabbed the ball out of teammate Matt Walters' hands, who had just intercepted it, and raced 80 yards for a touchdown. Reed was honored as the Big East Defensive Player of the Year in 2001, and was named National Defensive Player of the Year by Football News. He was a finalist for the Jim Thorpe Award and was a semifinalists for the Bronko Nagurski Trophy. Reed set several records during his time at Miami. He holds the record for career interceptions with 21, career interception return yards with 389 and interceptions returned for touchdowns with five. He also blocked four punts during his four-year career. In addition, he was a member of the track and field team during his years at Miami and was a Big East champion in the javelin. After his college career, Reed was drafted by the Baltimore Ravens in the first round (24th overall pick) of the 2002 NFL Draft. In his rookie season, Reed started in all 16 games and finished the campaign with 85 tackles, one sack and five interceptions. The following year he finished the season with 71 tackles and seven interceptions and was voted to his first Pro Bowl. In 2004, Reed was named the NFL Defensive Player of the Year by the Associated Press. In addition to his record return in 2004, Reed set an NFL mark for most interception return yardage in a season, accumulating 358 return yards on 9 interceptions; Reed held this record until 2009, when it was exceeded by Darren Sharper. He also returned an interception 106 yards for a touchdown, which was an NFL record until Reed himself broke it in 2008. Also in 2004, Reed became the only player in Pro Bowl history to block a punt and return it for a touchdown. In 2005, Reed only played in ten games due to an ankle injury and finished the campaign with 37 tackles and one interception. In 2006, Reed recorded 60 tackles and 5 interceptions and was voted to his third Pro Bowl. In 2007, he made 39 tackles and 7 interceptions. In the 2008 Pro Bowl he recorded two interceptions, tying the Pro Bowl record. During a game against the Philadelphia Eagles on November 23, 2008, Reed returned an interception for what was originally reported as an 108-yard touchdown return (later officially adjusted to 107 yards by the Elias Sports Bureau). This set an NFL record, breaking his own record of 106 yards set in 2004 against the Cleveland Browns. The ball he intercepted and the jersey he wore during the play are now in the Hall of Fame. In the Ravens' 2008 AFC Wild Card game against the Miami Dolphins, Reed intercepted Chad Pennington twice, returning one for a touchdown. He intercepted three passes in 2009, returning one for a 50-yard touchdown against the Cincinnati Bengals, and added two more interceptions in the playoffs, but fumbled one away in a 20-3 loss to the Indianapolis Colts. Reed was the only player unanimously voted onto the AP 2008 NFL All-Pro team. In 2009, Reed was selected to the Sporting News's Team of the Decade (2000's). Reed playing against the Oakland Raiders in 2012. In 2010, Reed led the NFL in interceptions with 8, despite only playing in 10 games due to hip surgery. In Week 1 of the 2011 NFL Season, Reed recorded 2 interceptions against Pittsburgh Steelers quarterback Ben Roethlisberger, surpassing Ronnie Lott for most games with multiple interceptions. He finished the regular season with three interceptions and a sack/fumble. Reed also intercepted T. J. Yates in the fourth quarter of the 2011 AFC Divisional Round After deflecting another pass later to seal the win, Reed was injured slightly, but played the next week in an AFC Championship loss to the New England Patriots. Reed skipped out on a mandatory minicamp, but returned for training camp. In Week 1 of the 2012 season, Reed returned an Andy Dalton interception 34 yards for a touchdown against the Cincinnati Bengals, making Reed the NFL's all-time leader in interception return yards. On November 19, Reed was given a 1-game suspension by the league "for repeated violations of the rule prohibiting hits to the head and neck area of defenseless players" following an unnecessary roughness call for a hit on Emmanuel Sanders. Reed was considered a repeat offender based on his prior hits to Deion Branch earlier in the season and to Drew Brees in 2010. This suspension was later overturned, and Reed was fined $50,000 for the hit. Reed said on January 24, 2013 that despite repeated reports he might retire, he intended to play the next year. Reed finally earned his first Super Bowl ring when the Ravens defeated the San Francisco 49ers 34-31 in Super Bowl XLVII. In that game, Reed intercepted Colin Kaepernick for his ninth career postseason interception, which tied the NFL record. This interception was the 49ers' first interception, and the final score resulted in the 49ers' first Super Bowl loss in their franchise's history. Reed has scored a total of 13 touchdowns in his career with the Baltimore Ravens — 3 blocked punts, 1 punt return, 2 fumble returns and 7 interception returns. On March 22, 2013, Reed signed a three-year contract worth $15 million with $5 million guaranteed with the Houston Texans. Later in the 2013 offseason, Reed underwent arthroscopic surgery in his hip to repair a small labral tear. Reed made his Texans debut on September 22, 2013 against the Ravens in Baltimore. As the season progressed, Reed saw his playing time reduced. He eventually lost his starting job to Shiloh Keo during Week 9 against the Indianapolis Colts. On November 12, 2013, Reed was released by the Texans after displaying limited production with just 16 tackles, no interceptions, no forced fumbles, and no passes defended through 7 games. Reed was signed by the New York Jets on November 14, 2013 after clearing waivers. The move reunited Reed with Rex Ryan, whom he played for when Ryan was the defensive coordinator of the Baltimore Ravens. Reed played his first game as a Jet on November 17, 2013 against the Buffalo Bills. In Week 14, he recorded his first interception of the 2013 season against Oakland Raiders quarterback Matt McGloin. In Weeks 16 and 17, against the Cleveland Browns and Miami Dolphins respectively, Reed had an interception late in each game's fourth quarter, to preserve the Jets' win. The interceptions helped the Jets close the season with two straight wins to finish 8-8, which played a major part in Rex Ryan keeping his job as head coach. For the rest of the 2013 season, Reed played in 7 games (started 5) with 22 tackles, 4 passes defended, and 3 interceptions. Overall in 2013 combined with both teams he played for, Reed played 14 games (started 10) with 42 total tackles, 4 passes defended, and 3 interceptions. On January 13, 2016, Reed was hired as an assistant defensive backs coach for the Buffalo Bills. This reunited him with coach Rex Ryan for the third time, after stints together with the Ravens and Jets during Reed's playing career. ↑ Wilson, Aaron (2006-07-31). "Top free safety in the game". Scout.com. Retrieved 2008-11-28. ↑ Sando, Mike (2007-10-07). "Five to fear: Manning, Brady, Moss, Smith, Gates". Sports.espn.go.com. Retrieved 2008-11-28. ↑ Chadiha, Jeffri (2005-08-30). "Top 10 players at the NFL's hottest defensive position". Sportsillustrated.cnn.com. Retrieved 2008-11-28. ↑ Borges, Ron. "Belichick: Reed's a keeper". Boston Herald website. Retrieved 2008-11-28. ↑ Powell, Camille (2006-08-01). "Reed Is Determined To Outsmart Rivals". Washington Post website. Retrieved 2008-11-28. ↑ Hensley, Jamison (2005-07-06). "Spotlight on defensive backs". USA Today website. Retrieved 2008-11-28. ↑ Prisco, Pete (2005-09-04). "Secondary deceivers: Reed, Bailey best at sucking in QBs". Sportsline.com. Retrieved 2008-11-28. 1 2 Valkenburg, Kevin Van. Ed Reed, hiding in plain sight. ESPN. 29 January 2013. Retrieved 4 February 2013. 1 2 3 4 5 6 7 Player Bio: Edward Reed. hurricanesports.com. Retrieved 4 February 2013. ↑ Walker, Childs. In Saint Rose, La., he's still small-town Edward Reed. Baltimore Sun. 1 February 2013. Retrieved 4 February 2013. 1 2 "Baltimore Ravens " Players " Ed Reed". Baltimore Ravens Official website. Archived from the original on March 5, 2008. Retrieved 2008-11-30. ↑ Platania, Joe (2007-09-27). "Ed Reed: The Ravens' Bird of Prey". Pressboxonline.com. Retrieved 2008-11-28. ↑ Kim, Steve (2006-08-22). "Miami All-2000s Team: Defense". Miami.scout.com. Retrieved 2008-11-28. ↑ "South Florida Sports Paradise: Happy Birthday Ed Reed". Miamisouthpaw.blogspot.com. 2007-09-11. Retrieved 2008-11-28. ↑ "UM Sports Hall of Fame Announces its Class of 2012 Inductees - HurricaneSports.com - The University of Miami Official Athletic Site". Hurricanesports.cstv.com. Retrieved 2012-01-22. ↑ NFL Draft History. NFL.com. Retrieved 4 February 2013. 1 2 3 4 5 Ed Reed NFL Football Statistics. Pro-Football-Reference.com. Retrieved 4 February 2013. ↑ Reed's 106-yard interception return TD seals victory. ESPN. 7 November 2004. Retrieved 4 February 2013. 1 2 "Reed loses a yard, but interception return for TD still a record", AP at ESPN.com, November 26, 2008. ↑ Clayton, John. Position's physical demands taking toll on players. ESPN. 28 October 2005. Retrieved 4 February 2013. 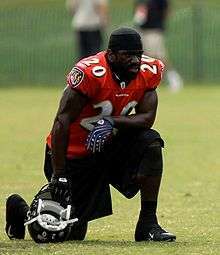 1 2 3 4 "Ed Reed: A rare safety, and Baltimore' gamebreaker". International Herald Tribune website. Associated Press. November 26, 2008. Retrieved 2008-11-30. ↑ "Reed rumbles 108 yards for NFL record". Pro Football Hall of Fame website. November 24, 2008. Retrieved November 30, 2008. ↑ "Jersey and football from Ed Reed's record interception return". Pro Football Hall of Fame website. November 26, 2008. Retrieved November 30, 2008. ↑ Pennington throws four interceptions in loss. ESPN. 4 January 2009. Retrieved 4 February 2013. ↑ Game 18: Ravens have painful reunion with Colts Jamison Hensley, Baltimore Sun Retrieved 31 October 2012. ↑ "Ravens safety Reed is only unanimous selection to All-Pro team". NFL.com. 2009-01-09. Retrieved 2010-12-24. ↑ Sporting News names its athletes, teams of the decade; LeBron James makes the cut. Cleveland.com. 25 September 2009. Retrieved 4 February 2013. ↑ La Canfora, Jason. Ravens will place six-time Pro Bowl safety Reed on PUP list. NFL.com. 3 September 2010. Retrieved 4 February 2013. ↑ Cole, Jason. "Reed is the greatest NFL thief of all time". Retrieved 15 September 2011. ↑ Ravens' Ed Reed hobbled but eager for AFC title game The Sporting News Retrieved 29 October 2012. ↑ Hensley, Jamison. No serious damage to Ed Reed's ankle. ESPN. 17 January 2012. Retrieved 4 February 2013. ↑ Ed Reed skips first day of camp Jamison Hensley, ESPN Retrieved 29 October 2012. ↑ Ed Reed reports to Ravens training camp Jeff Zrebiec, Baltimore Sun Retrieved 29 October 2012. ↑ Ed Reed takes interception to the house, record books Gregg Rosenthal, NFL.com Retrieved 29 October 2012. ↑ Jeff Zrebiec, Ravens safety Ed Reed not planning to retire after season. The Baltimore Sun, January 24, 2013. ↑ Adelson, Eric. 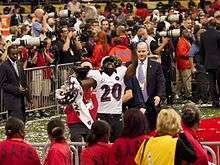 Emotional Ed Reed basks in Super Bowl glory by remembering his late brother. Yahoo! Sports. 4 February 2013. Retrieved 4 February 2013. ↑ Schwab, Frank. Ed Reed picks off Colin Kaepernick for first INT thrown by a 49ers QB in six Super Bowls. Yahoo! Sports. 3 February 2013. Retrieved 4 February 2013. 1 2 Wilson, Aaron. John Harbaugh says Ravens want to bring back Ed Reed. Baltimore Sun. 5 February 2013. Retrieved 6 February 2013. ↑ Hanzus, Dan. Ed Reed plans to sign contract with Houston Texans. NFL.com. 20 March 2013. Retrieved 21 March 2013. ↑ Wesseling, Chris. Ed Reed reportedly had arthroscopic hip surgery. NFL.com. 3 May 2013. Retrieved 25 October 2013. ↑ Vensel, Matt. Ed Reed makes his Houston Texans debut in return to Baltimore. Baltimore Sun. 22 September 2013. Retrieved 25 October 2013. ↑ Rosenthal, Gregg.Ed Reed demoted from Houston Texans' lineup. NFL.com. 7 November 2013. Retrieved 8 November 2013. 1 2 Woo, Stu (14 November 2013). "Jets Add Wisdom to Secondary". Wall Street Journal. Archived from the original on 15 November 2013. Retrieved 15 November 2013. ↑ "Jets safety Ed Reed gets first interception, victory of season against Raiders". nj.com. Retrieved December 8, 2013. ↑ Wesseling, Chris. "Reed announces retirement.". NFL.com. NFL.com. Retrieved May 6, 2015. ↑ "Ravens' Reed expected to play, not retire, after hip surgery". nfl.com. May 5, 2010. Retrieved September 5, 2010. ↑ Smith, Michael (January 13, 2016). "Rex hires Ed Reed as Bills' assistant defensive backs coach". NBCSports.com. Retrieved April 2, 2016.